Welcome back readers. Today I’m writing this article with my music blaring, and Janice and Leroy banished to the shady part of the yard for a while. Why? Because we got a new mailman. That may not sound like a reason to put my dogs in a time out, but if you heard them barking their heads off at this unfamiliar delivery man every day, you’d probably do the same. Dogs bark for all kinds of reasons, including strangers showing up in place of people they’d already become accustomed to. But since the old mailman retired, my pups will just have to get used to this new one as well. I’ve had a lot of friends ask me about dog barking before, wondering how to get their dogs to give them some peace and quiet. Most dog owners don’t seem to mind dogs barking when they are playing, or alerting them to something important – but they all want to know what they can do to train their dog to stop barking at things like passing cars, mailmen, or other daily nuisances. I gathered up some of the most recommended dog barking tools so that you can see what the options are, and which tool might be best for you. But the truth of the matter is that dogs bark as a means of communication – and to them, the mailman could be a potential danger. You don’t want to teach your dog to not alert you when they need to. They could come to recognize the mailman as a friend, but what happens when you get a new mailman? Well, dogs will do what dogs do. And there may be little you can do about it. One of the most controversial tools to stop a dog barking is a bark collar. These may work for some dogs, but they don’t always work every time. In addition to being unreliable at times, you also have to decide what type of bark collar you want. There are some bark collars that produce a small sound or vibration when a dog barks. The theory is that they will recognize this sound or vibration as a cue to stop barking, if you train them to respond to it. However, many dogs that are trying to communicate will just ignore these cues because they believe they have something important to tell you. to come to you when something is wrong. Why is Your Dog Making Weird Noises? Finally, there are collars that will spray a dog with a citronella spray to cue them to stop barking. 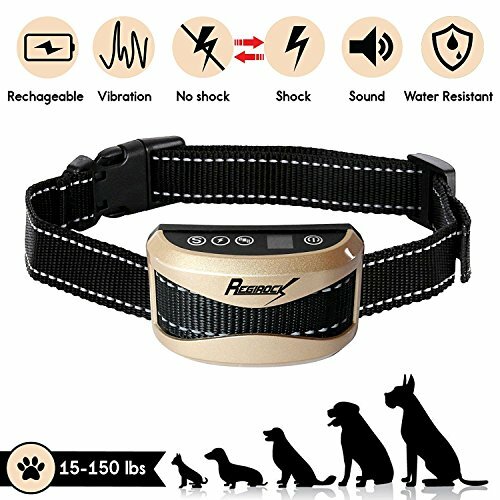 This type of collar is more humane than a shock collar, but still provides a negative feedback to the dog so they begin to associate barking with a consequence. Once again, this could cause a dog to lose the desire to communicate at all, so you may find that your dog doesn’t alert you when something is wrong in the future. In my opinion, if you want to use a collar to stop barking, go with the one that simply makes a noise. Use this collar the same way you would clicker training. That is, train your dog to think of the noise as a cue to look at you or come to you. They will generally stop barking when they are performing this task that they’ve been taught, and that solves the problem without teaching them not to communicate. 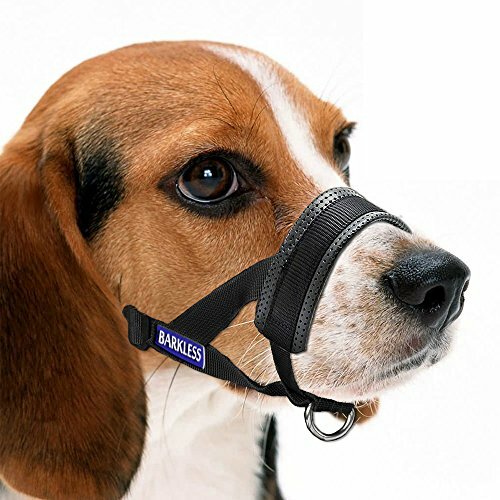 Another option that some dog owners use for dogs that just cannot be quiet is called a soft muzzle or a Husher. These muzzles allow a dog to eat, drink, and pant – very important, since dogs cannot regulate their body temperature through sweating – but won’t allow a dog to open their mouth enough to bark. They could still make noise through whining or growling, so they will still be able to communicate with you in some way. This may be a good idea for temporary use, such as when taking a walk or going to a crowded area, if you want your dog to not alarm anyone. However, no dog should ever wear a muzzle of any kind for an extended period of time. Another way to help a dog stop barking is to use free-standing noise making devices. 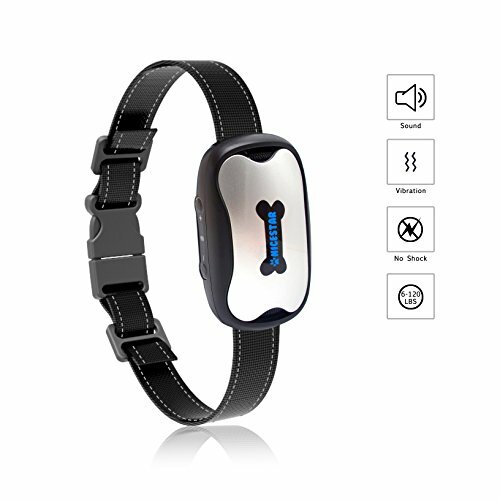 There are some that emit a beep similar to a bark collar, while there are others that make a pretty melody, meant to calm the dog down and get their attention. These devices mix the sounds with a frequency that only dogs can hear, which is what helps keep the dog’s attention focused on the sound rather than whatever they are barking at. I personally don’t think these are very effective. They require your dog to be close enough to the device to hear the sound, and it wouldn’t be hard for a dog to just ignore the sound. If a well-trained dog is already so distracted that they are ignoring their training, it isn’t likely that something making a noise will override whatever it is that has made them want to bark. Sometimes what you need to do is understand why a dog is barking in the first place. It could seem like it’s the appearance of a new mailman – but the real problem could actually be that your dog is anxious because you aren’t around very often and they’ve gotten over-sensitive about protecting the house. In this case, there are a lot of things you can do to help a dog feel less anxious. Consider spending more time with your dog, especially if that time involves exercise. Helping a dog work out excess energy is the best way to prevent anxiety from building up. This also makes your dog feel safer, so they may be less likely to react with alarm at the sight of someone new. Try using a calming supplement. 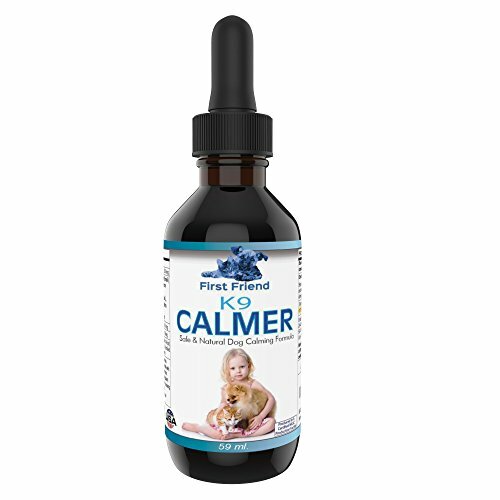 There are many canine-safe anxiety supplements that you can add to your dog’s water to help them feel a little calmer throughout the day. Be sure to talk to a vet before adding any sort of supplement to your dog’s diet. anxiety, this is a place where they can go to calm down and feel safe. You can direct your dog to the kennel when you notice them barking, and the act of going here should help them feel calmer. Is your dog anxiously barking because of loud noises like thunder or fireworks? Try a Thunder Shirt. 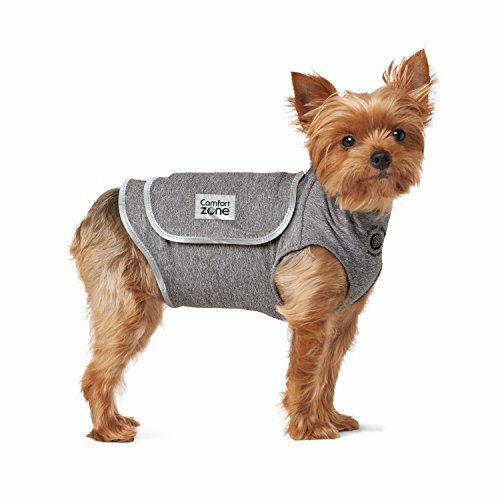 These dog vests offer a small amount of compression that is meant to help dogs feel less anxiety. They come in all sizes for dogs, from toy breed to giant breed. Another way to help a dog stop barking is to make sure they can’t see what they are barking at. For example, if you have a dog that sits outside all day and goes crazy at traffic, consider installing a fence that blocks him or her from seeing the traffic. If the mailman is the big trigger and you live in town, consider getting a P.O. box at the local post office if the barking bothers you or your neighbors that much. If you must leave your dog at home during the day, consider creating a special “dog zone” in your home where the dog is blocked from rooms that have windows facing the street. If the problem is squirrels running up and down the trees in your yard, consider talking to a pest control service about what could be done to get rid of these mischief makers. The best way to determine what it is you need to block your dog from being able to see or hear, is to watch them carefully and determine what kind of barking they are doing. If they bark when they see or hear a mailman, a squirrel, someone passing on the sidewalk, or other things like that – it is most likely territorial barking. Your dog is letting everyone know that this is their home and that they will guard it. It’s annoying to us, but it’s part of what makes a dog a dog. If they are barking only when they hear or see something out of the ordinary – say, when a very large delivery truck goes by on your otherwise quiet road – then this is alarm barking. They are letting you know that something is amiss, in their eyes. This type of barking is the one that I think you should be the most careful about when training your dog. You don’t want to teach them that they shouldn’t alert you to anything – what if they get hurt but are conditioned not to communicate with you? What if someone breaks into your house? Tread lightly when training a dog to respond to surprises. If they tend to only bark excessively when they see you or another person, and this barking is accompanied by happy body language like tail wagging or jumping around, they are just saying hello! This type of barking can often be trained out of a dog. 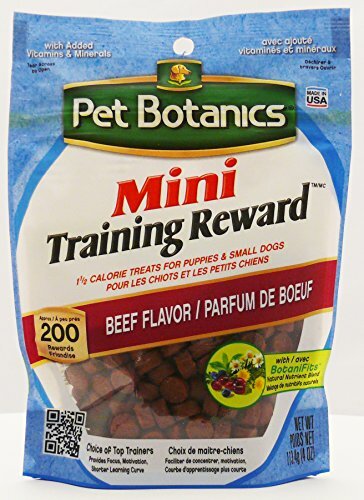 Teach them to greet you or other people in a more acceptable way with treats and other training tools. If they tend to bark only when they hear another dog barking, this is called response barking. It’s a way that dogs communicate with each other, and while you can train a dog to not respond, it may be hard. This is a very primitive instinct in a dog, similar to the way a baby cries when they want food. If your dog is simply barking for no apparent reason, especially if that behavior is accompanied by pacing, whining, digging, or destructive behaviors, they are likely just frustrated or anxious. In this case, what they need is attention and exercise, rather than correction. Of course, you can train your dog for your own comfort and sanity, but what if you don’t really mind the occasional bark and your neighbors do? What if your landlord has told you to keep your pet quiet? One thing I would suggest is to ensure that your dog is very well trained to respond to commands that keep other people safe, such as heeling on command or sitting and staying on command. Many people find the sound of a dog barking to be scary, and if your dog is otherwise trained to be non-threatening, they may be less inclined to complain. However, in this case, you may find it better to train your dog to “settle down” on command – in other words, teach your dog to lay down and get quiet until you release him. Chances are that your dog will fall asleep or get bored and give up the barking before you release him. Learning how to properly balance barking behavior with human needs is a tough one. Clearly, not even I have a great handle on it. Janice and Leroy will get used to the new mailman soon, and in the meantime, they’ll just spend a little more time outside while I try to get some work done. Use these five tools, and try to discover the real reason your dog is barking, to manage your pet’s loudest behavior.